South Sea pearls can reach up to 20mm in diameter, which makes them exceptional luxury items because they are the largest pearls on the jewelry market. Largely farmed in Australia, but in Indonesia and the Philippines as well, South Sea pearls are produced by the Pinctada maxima, the silver, and gold-lipped oyster. South Sea pearls are nucleated, which provides them with a flawlessly round shape. 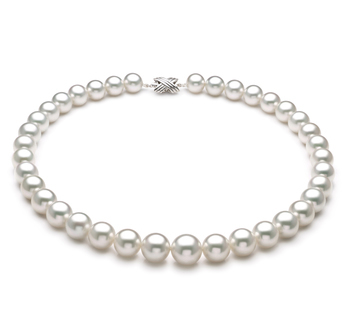 With record-breaking sizes of 18-20mm, white South Sea pearls are significantly more valuable than Tahitian pearls, as well as Japanese Akoya and Freshwater ones. Round South Sea pearls are rare. Less than 20% of them are round actually, but those that are present a flawless shape that sets these pearls apart from all other categories. South Sea pearls display a distinct inner glow. 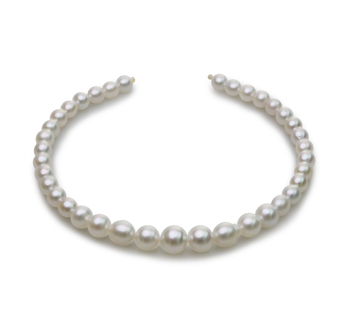 White Japanese Akoya pearls might be able to partially match their luster South Sea pearls are significantly larger. This sets them apart on the jewelry market from any other type of pearl available. White South Sea pearl necklaces are the epitome of elegance and refinement. A distinguished piece of jewelry, the strand of White South Sea pearls never goes out of style and looks ravishing on all women. Consider these pointers when browsing through necklaces. No two pearls are identical. When it comes to the shape of South Sea pearls, you can choose from two different kinds. For the traditional woman who desires to look classy at all times, a strand of round graduated pearls is an indispensable accessory. This luxurious piece instantly elevates relaxed outfits and completes elegant attire. Not only symmetry is beautiful. A strand of White Baroque South Sea pearls is the favorite jewelry item of the modern woman who dares to be different and is not afraid to try something new. All South Sea pearls are gorgeous, however, they are each destined for different types of occasions. These tips will guide towards the right decision. Choose necklaces that have small white South Sea pearls if you want to get the most wear out of your jewelry. The small size of the pearls makes them versatile. They can be worn during the daytime, with modern office dresses and are easily transitioned to eveningwear. Medium sized white South Sea pearl necklaces look stunning with most dress necklines. Reserve this glamorous necklace for cocktail parties where you need to look classy and professional. White South Sea pearls can easily reach 17mm. Their beauty shines best when the gems are used in graduated necklaces. The ideal event to display a fabulous white South Sea pearl necklace this size is your wedding. The color is perfect for the occasion and the jewelry item is timeless.